Nothing adds more drama to a dinner party than a flaming dessert; a feat easily accomplished by using one of several variations of Crêpe Suzette recipes. Despite the fancy French name, these recipes contain few ingredients. They are among the most simple and elegant desserts to make because the crêpes are preparable well ahead of time and the sauce comes together quickly. Crêpes intimidate many cooks, no matter how many times they are assured the delicate disks are nothing more than super thin pancakes. If possible, make the crêpes in advance. They refrigerate or freeze well in securely sealed freezer bags with sheets of parchment or waxed paper between them for easy separation. Place the first four ingredients in a blender and mix on high until perfectly smooth. Unlike pancake batter, lumps are not acceptable in crêpe batter. Refrigerate the batter for at least two hours to eliminate the air bubbles and give the flour a chance to expand and make the batter light and delicate. Heat a crêpe pan or very shallow nonstick 8-inch skillet over medium heat. Add a pat of butter and heat until foamy or coat the pan's interior surface with cooking spray. Pour about four tablespoons of crêpe batter into the pan and immediately swirl it around to cover the bottom of the pan completely. Cook for one minute, until the surface looks dry and the underside is lightly brown. Flip and cook for 30 seconds more. Remove to a plate and repeat until the batter is gone. You should have about 16 crêpes when finished. Set them aside and proceed with the sauce. 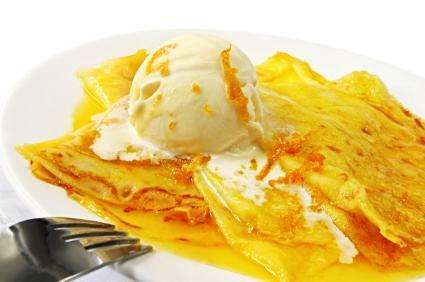 The rich orange sauce is what distinguishes this recipe from other dessert crêpes. Although the addition of Cognac or brandy is optional, it makes the flambé more dramatic. Melt the sugar into the butter in a large nonstick skillet over medium to medium-low heat. Use at least a 12-inch skillet, preferably larger, to accommodate the crêpes easily. Add the zest and juice and simmer for one to two minutes. Carefully add the crêpes, one at a time, completely covering them with the sauce. Gently fold each crêpe into quarters and arrange them in an overlapping pattern around the inside of the pan. Mix the Grand Marnier and Cognac or brandy and pour over the crêpes. Quickly ignite the liquor with a match or lighter and garnish. Serve the crêpes as soon as the flames subside. A scoop of ice cream on the plate makes an attractive presentation. This twist on the traditional recipe won the 2009 Citrus Dessert Challenge in 2009 and deemed the official dessert of the 2009 Spherion Citrus Parade. Instead of incorporating only orange flavor into the sauce, it adds the complexity of tangerines, lemon juice and honey. Use the same crêpe recipe as for traditional Crêpes Suzette. Melt the butter in a large skillet over medium heat, making sure the pan is large enough to dip and coat the crêpes. Mix in the remaining ingredients and simmer, stirring constantly, until the mixture reduces to 2/3 cup. Dip and coat each crêpe and fold into quarters. Arrange the folded crêpes in an orderly fashion around the inside of the pan. Serve with tangerine wedges and, if desired, a scoop of creamy vanilla ice cream. Note: This recipe does not include a flambéing step, perhaps due to the honey in the recipe, which may deter flaming or take on an undesirable consistency if exposed to fire. If you've mastered the Crêpe Suzette recipe and enjoyed the theatrical presentation of flambé, seek out other recipes that require igniting the food just prior to serving it. There are many sweet and savory dishes available to satisfy the culinary firebug in many gourmet cooks.